Also, we could attend to a music festival where I felt the Balkans coming. Great talent, musical and crazy life. Two youngsters perform traditional dances from Puszta, the great plain between Hungary and Serbia where you can still see a world made of horses, nature and a wide sky. One evening, we also get back to Szentendre (the nice city with Orthodox churches that we visited last year) along with Joszeph, Imre and Laszlo. We’re greeted by a huge rainbow over the Danube, after a very rainy day. 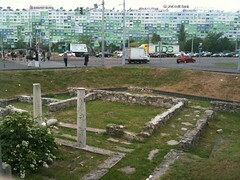 Under the modern Obuda we get to discover the roman Aquincum, that was home of about 6.000 legionnaires. There are many of their structures still visible, such as the thermal pool, the heating channels, various stems and high relieves, placed side by side with air conditioners and shops. 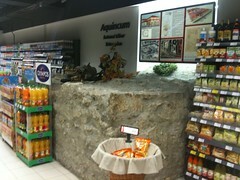 Even in the supermarket you can see a big roman pillar. It could be a great touristic resource but never mind. After all, the oblivion of the roman world, who “colonised” (a soft way to say submit) people who were living quietly, doesn’t bother me at all. Although I appreciate beautyful man-made things, I greatly prefer to preserve a forest rather than a pile of rocks, carved from a mountain that’s gone forever. A man-centered universe frightens me. Living for appearances is dangerous such as, or even more so, the true and archaic barbary. If you look to the results, the Romans destroyed way more than the so called barbars. The Dalmatian forests will never get back the way they were, as the great woods of the Po Valley are gone. They needed masts for the ships, to build the empire of greedy boys. But that’s the history of man. For a couple of “civil” spike heels we steal the planet from our children, from the “savage” animals . We wait for James Thomas who was willing to embark with me on Clodia, but the Unicef has set him a few extra meetings, so we greet on the pontoon. We know that we’ll see each other pretty soon, as usual between travellers. The nights aboard Clodia with Stephan, James, Anna, Alessandra and Leon have been very nice and simple: an oil lamp, rice and eggs bought from a lady farmer in the Obuda Festival bio market. 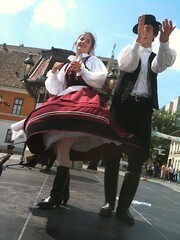 Here we’ve also met Attila and Réka who sold us goat milk, beetrot juice and a cheese that we’ve called “the smeller”. It’s a Hun bomb: Paprika and spices all mixed together, in a pulp that changes your life in the blink of an eye. 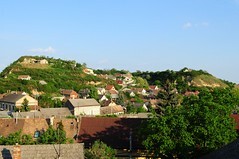 The town of Obuda has four museums in a single square, noticeably that of Vasarely, the famed op artist. I spot the Pal Street but I know it’s not the famous one. 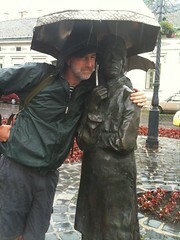 A great love for the bronze statues from Harrer Pal, the Women with Umbrella, very well known. I can also admire a generation of people in the after hours of Obuda Island, a concentration of the tackiest discos ever to be seen. A full range of drugged culturists and hypertrophic girls, not a pretty sight. If this is going to be the future Hungary, better get away. But then, I see Laszlo and a great man, Lányi Gj?rgj, who teaches singing to children and plays powerful songs. The kids are enraptured. A genius. It’s time to keep going, between contrasts, beauty and a western lifestyle that often flattens everything. 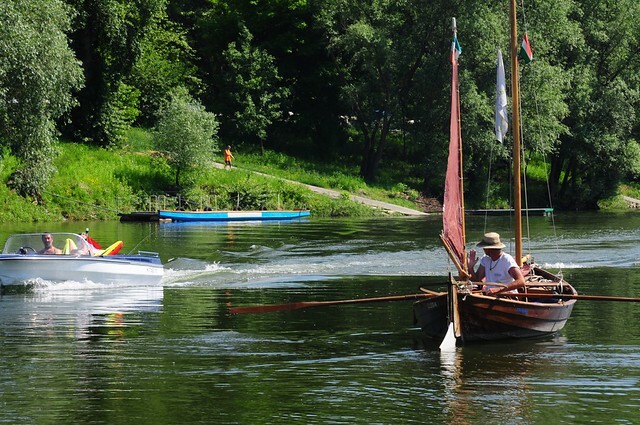 We can’t even make it for a meeting with Vituki about the Danube’s waters. 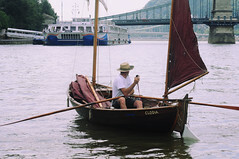 We set sails, as Bruno always loved to do: He’s now crossing the Atlantic with Josephine. First stop after 36 km in a small, protected oxbow close to Ersci. We see the real weeping willows. And weep they do. Double anchor and a good sleep. In the morning, fog. 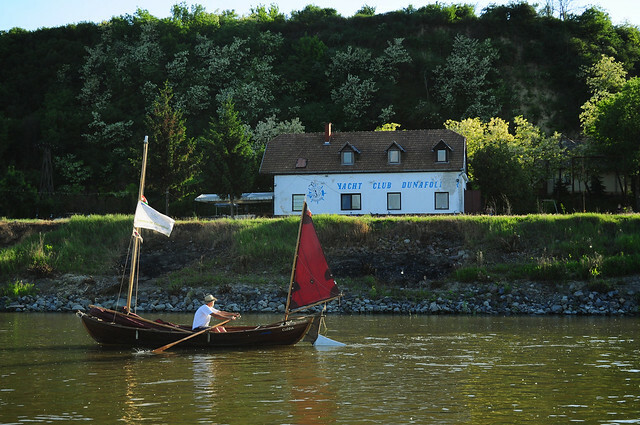 The Danube is very natural. Young and old willows, logs, eroded sides, beaches and oxbows, so many fishes. Just after setting off, a thrill! Serena’s engine switches off and doesn’t seem to restart. I take off the spark plug and take a look, but in the menatime I don’t pay attention about what happens ahead. “A waterfall!” screams Leon. It’s a rapid. I very quickly drop the anchor but it doesn’t work! I think: “I have to let them go to save at least Clodia”, then I change my mind: “No, we have to live or die together!”. With the two boats tied, we desperately row and we just make it. Quidado Giacomo!! Then, I tow Serena on a little beach, change the spark plug and everything goes well. Leon and Anna are great, and Leon had never driven a boat before. Not easy with all this current, and filming at the same time. In Dunaföldvar, after 54 very tiring kilometres, we moor in a little protected harbour within a wonderful Yacht Club. 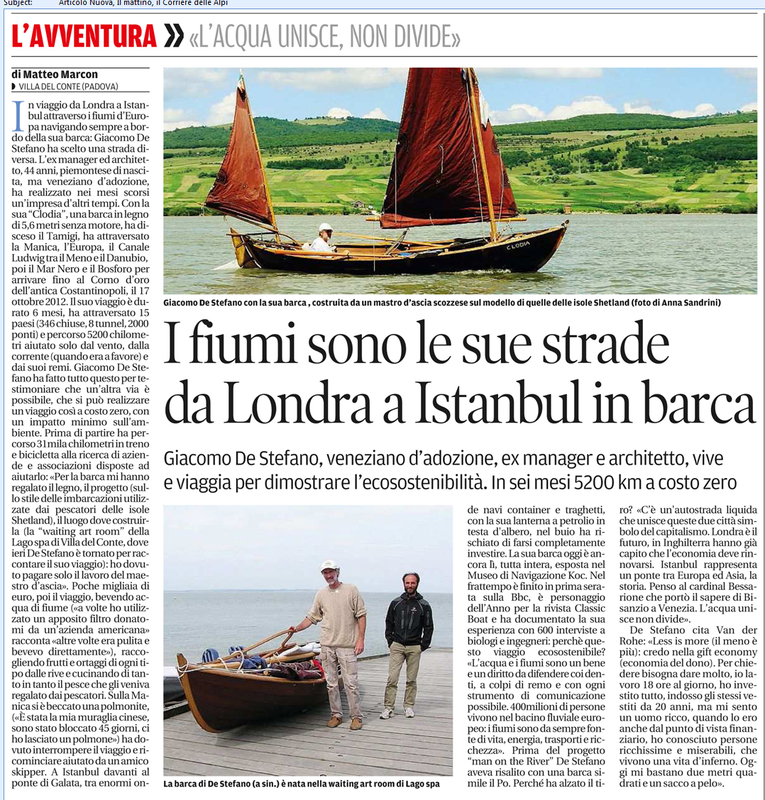 Simplicity, canoes and generosity. We get welcomed by three nice young men who speak an excellent english. 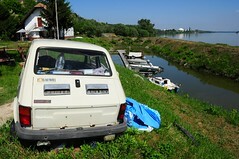 The old club warden sleeps in a FIAT 126 that looks like just about to fall into the river. He’s strong and talk to us in Hungarian, very slowly so we can’t understand in a better way, praising the local beauties. I see the baths, the castle, the calvary and the church. We meet Szusanne who beautifully molds clay, and a nice man who takes us to visit the roman low reliefs in his house, just next to the castle. A dream. We also spot a monument to the russian soldiers, still in place. For the first time in my life, I get a lift aboard a Trabant Station Wagon, and it’s a good experience. We keep quiet for the rest of the day, working on the Internet. The next morning we sail for 36 km up to Paks, where we get asked 20 euro for mooring in a little harbour. We gently refuse and, following a few canoes, arrive to a pretty restaurant nestled in a small bay. Here, in return for towing a boat, we get three good beers. The night is quiet but cold: The first mosquitoes come to visit. We get up at 5,30 and set off for another 50 km to reach Baja. I sail close-hauled against the wind that’s getting stronger. In Baja we meet Nicola, filmmaker and friend: A thunderstorm is coming and it’ll last all night. It’s an evening of music: There’s a festival of the fish with local very powerful songs played. In the night the wind makes Clodia wobble a bit (but the tent is quite safe) and brings me some rave music from afar. From 30 °C we dropped to 11 °C of temperature. 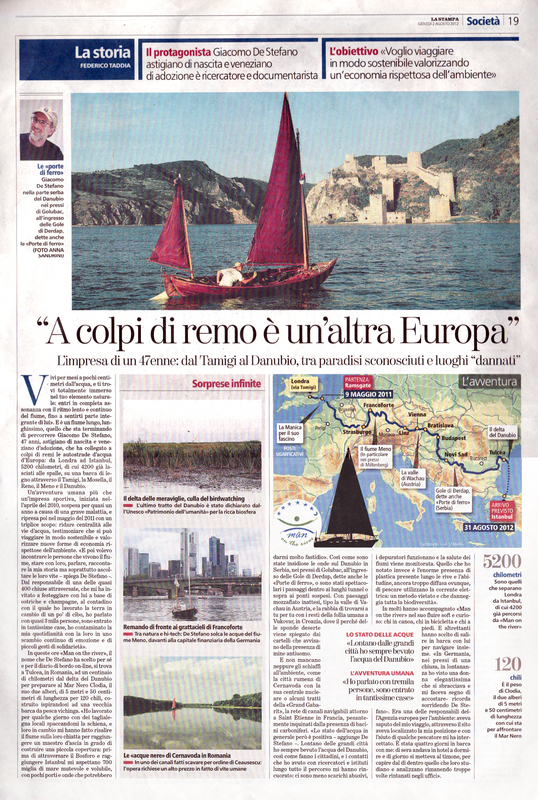 While in a bar, I see a newspaper with an image of Venice, my beloved and hated city, where the America’s Cup costly toys are turning upside down. How sad to have all these money placed in such little and greedy hands. When will we grow? When will we understand? 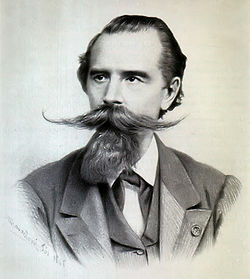 I discover that Baja was the birthplace of István Türr, who was a famous engineer of canals. He deserted the Austrian army, fighted in Italy in the 1848, got wounded in Brescia, then became lieutenant general for Garibaldi. 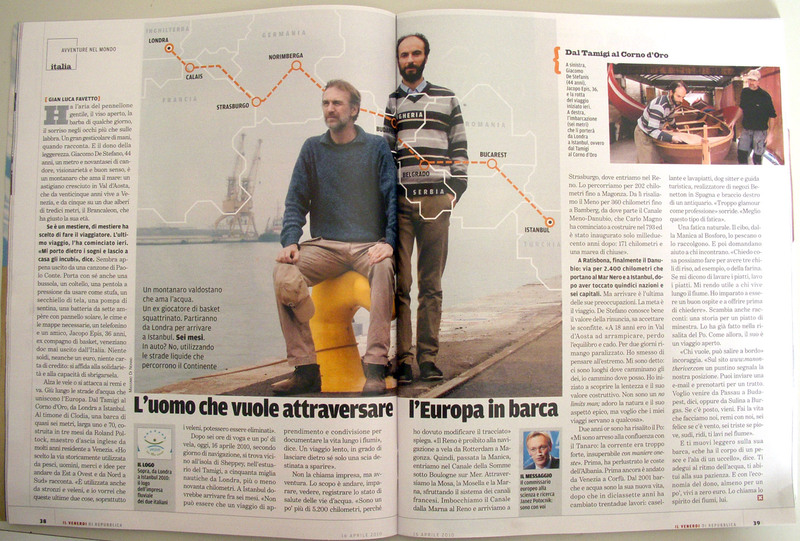 He’s one of the famous 1.000 men reuniting Italy: From Baja to Quarto. Such a nice and generous people. Still in Baja, after three rainy days, I meet Joszef who tells me about his journey by bike to Rome, back in 1974 when it wasn’t so easy to travel. 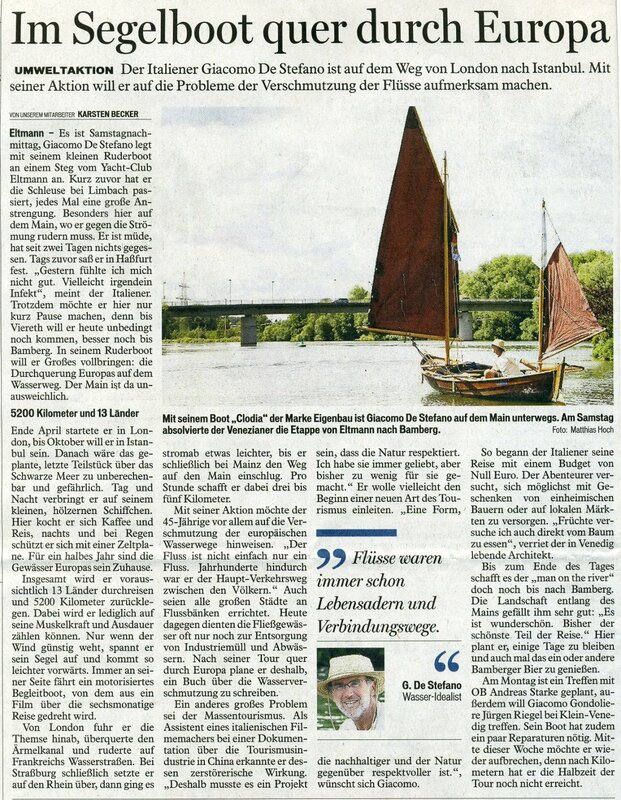 Joszef is a chemist who used to analyse Danube waters. Since Budapest depurator has begun to work, the water is much cleaner, he says. His opinion about the situation in Hungary is worrying, but non so different from those you can here all around the world. People who wants too much and people who has nothing. Corruption and power games, in the usual hands. The same people of the despotic socialism. Annett, a nice girl with wonderful eyes, has lived in London for three years and is now working in the Daniel’s Cafè where we stay all day connected to the web. She loves Baja and came back here. 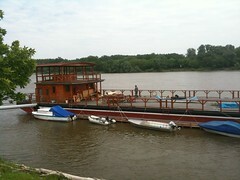 She also loved the Danube and all the chances it gives: Sport, tourism, leisure. Annett gives us some help with a language, Hungarian, where we’re helpless, apart from “yes”, “no”, and “thanks”. Ivett speaks Italian. She’s a beautiful woman and manages an Italian restaurant, the Riverside Pub, where we have a nice meal. She came back here from Italy, but wants to return there. The crisis here is strong, it’s hard to work even if Baja has a very good geografical position. 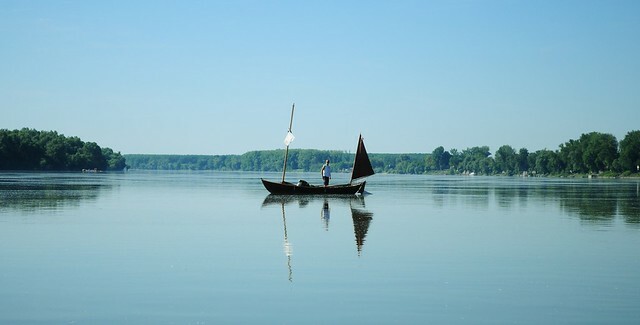 Two national nature reserves, two rivers, baths in Dunaföldvar and Mohacs. We’re about to leave this wonderful country. I’d love to live here for a while to understand more of it, but a journey is also about separations. We’ve now arrived to Mohacs, next to the Serbian borders, after 33 km of sailing in three hours. 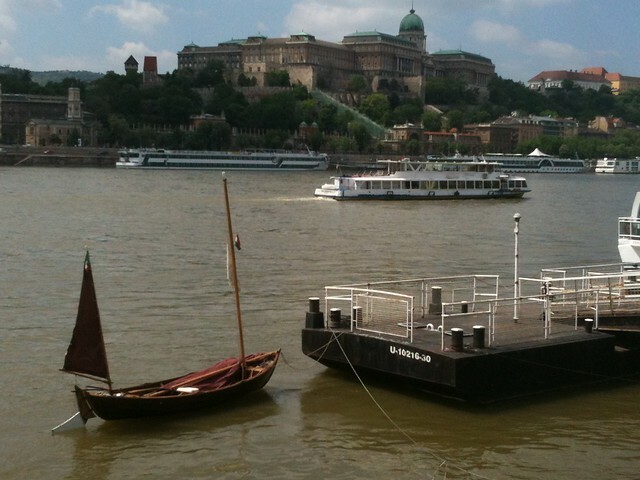 Here, in 1526, the Ottomans defeated the Hungarian armies. And they brought a new world along with them. A wonderful story so far. I take a look at your map and see that we sail in parallel these days! After Venice and Ravenna we’re now on the beautiful island Vis in Croatia. So we keep you in mind. Have good winds. Caro Giac, troppo giovane per morire. Riposa in pace! Nonostante le righe tristi, grazie per il nuovo articolo! Bello incontrarci nelle parole, nelle foto! Buon vento, ma non troppo…..